ජනාධිපති මෛත‍්‍රිපාල සිරිසේන පුරසාරම් දොඩවනවා මිස රට පාලනය කරන්න දන්නේ නෑ..
හිටපු ජනාධිපති මහින්ද රාජපක්ෂ පරාජය කර බලයට පත් කරගත් පුද්ගලයා තවත් මහින්ද රාජපක්ෂ කෙනෙකු වී ඇති බව සාධාරණ සමාජයක් සඳහා වූ ජනතා ව්‍යාපාරයේ සම කැඳවුම්කරු මහාචාර්ය සරත් විජේසූරිය මහතා පවසයි. ජනාධිපතිවරණයේ පොදු අපේක්ෂකයා මාදුළුවාවේ සෝභිත හිමියන් සමඟ අත්සන් කළ ගිවිසුම සටකපට ලියැවිල්ලක් බවට අද පත්වී ඇතැයි ද මහාචාර්යවරයා සඳහන් කරයි. ජනාධිපති මෛත්‍රීපාල සිරිසේන කතා කළ යුත්තේ හොඳ අගමැතිවරයකු පත් කිරීම ගැන නොව විධායක ජනාධිපති ධුරය අහෝසි කිරීම ගැන බව ද ඔහු කියා සිටී. ජනාධීපතිවරයා වේදිකාවන්හි සිට දර්ශනය ගැන පුරසාරම් දෙඩුව ද රට පාලනය කිරීම සඳහා දර්ශනයක් නැති බව ක්‍රියාවෙන් ඔප්පු කර ඇතැයිද විජේසූරිය මහතා පෙන්වා දෙයි. ඉදිරි ජනාධිපතිවරණයේදී නැවතත් පත්කරගැනීම සඳහා ජනාධිපති මෛත්‍රීපාල සිරිසේන නුසුදුසු බවත් ඒ ආකාරයෙන්ම අගමැතිවරයකු වීමට රනිල් වික්‍රමසිංහ මහතා හා නුසුදුසු බවද ඔහු සඳහන් කරයි. ජනාධිපති මෛත්‍රීපාල සිරිසේන තමාට බලයට ඒමට උදව් කර බලවේගයට එන්ජීඔ් කාරයන් යයි ලේබල් ගැසීමෙන් නිර්පාක්ෂික පොදු අපේක්ෂක බලයට පත් කර ගැනීමට ගොස් නීතිගරුක පුරවැසියන් ඉගෙන ගත්තේ පාඩම ජීවිතේට අමතක නොවන පාඩමක් යයිද ඔහු වැඩිදුරටත් පැවසීය. Raththaran minihek elawala Thopima path karagaththa gonnu dennek dan kapiyaw unge goma anachariya. මුන් පාඩම් ඉගෙනගන්න කොට රට ඉවරයි…..
O.L wath nethi nuugat his minissu ratak watina ugathekuta katha karana heti… thatthala keepadenekuge daruwek sure. තාම ඉගනෙ ගන්න මහාචාර්‍යවරැන්, හොදට ඉගනෙ ගනෙ යමක් කරන්න පුරැදුවන්න කියලා, කියලාදෙන්න කවුරැත් නැද්ද? පැරදිච්ච දේශපාලකයො පත්කරගන්න, හැමදාම ඉස්කොලෙ යන අය ඉන්න රටෙ, අරාබියට තුට්ටු දෙකට විකුනන ගැහැනු ශ්‍රමය නවතා, මැරෙනක් ඉස්කොලෙ නොගිහින්, පරතෙරට දැනුමක් දෙන අධ්‍යපන ක්‍රමයක් සකස් කර, අනිත් ජාතීන් පිලිගන්නා ගමන් බලපත්‍රයක් ඇති පුරවැසින් බිහිකල හැකි, කොන්දක් ඇති, සිංගප්පුරැවෙ කලා වගෙ, ඉන්න සේරම හොරැ හිරේ දාලා, දැනටමත් පාඩම් ඉගනෙ ගත්ත, මොල කලඳක් තියන ලාංකිකයෙක් මෙ තුන් සිංහලේම නැද්ද රට ගොඩගන්න? NGO kukka ayith kata arala gade baha. Karawchcha rotiyath ekka ubala givisum gahuwe oka kiyanna thamayi. kalakaniniya walaliyan thope sohonatath hena gahanawa yako. Ratata janathawata karapu aparadeta. නීතිගරුක පුරවැසියන් – Munta pissu. How can they say නීතිගරුක පුරවැසියන්. Mun rata bedhana wyaparaye poorogamiyo. Munta gahanna one kossen. yes of course…it is perfect statement..
සිරිසේන අන්තිම ජරා මිනිහෙක්, වැඩකට නැති නිකමෙක්. මමත් මෝඩ වෙලා මගේ පලමු චන්දෙත් දීල ඉගෙන ගත්තු එකම දේ හමයි, එකෙක් දුර්වල නිකමෙක්, අනිකා කුහක දේශයේම හතුරෙක්. Tho janadipathige saha agamathige nusudusukam balanna issella thoge sudusukam balaganin wasalayo. Najachcha wasalo hothi-najachcha hothi mahachaariyano! Kammana wasalo hothi-kammana hothi mahachaariyano! Keneku mahachaarya wanne uthpaththiyen ho ugath kamin nova ohuge kathaawen saha kriyawalini! Mr. Sarath Wijesooriya, it is great that finally you have realised the mistake of bringing My3. 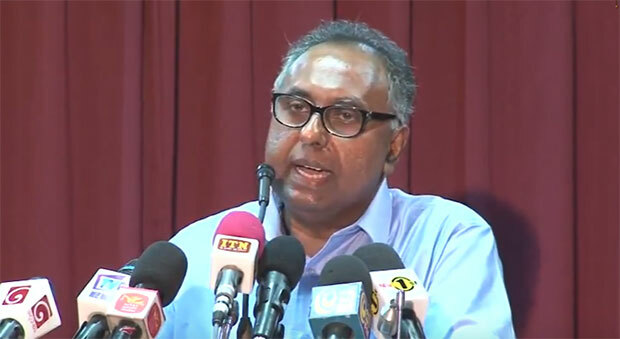 He was not a person who can run even a Ministry like Mahaweli. He has really ruined that Mahaweli Authority. You just check the current situation of Mahaweli Organisation. No Water Management at all, no engineers or capable people in Mahaweli Organisation except My3’s Golaya’si. How can we expect to run this Country productively by appointing a person like My3 who was failed to push at least Moragahakanda – Kaluganga Project [M-K Project] during his tenure from 1994 onwards? He is now telling lies. Dr. Kulasinghe didn’t do any productive work for this M-K Project. He was not even an Irrigation Engineer. Ivan de Silva, who was former Secretary/ Irrigation is the person behind all those success of My3’s M-K Project as well as Api Wawamu – Rata nagamu. My3 is just giving wrong publicity. Surface the truth for the benefit of the country. කෑගල්ලේ, අරණායක සාමසර කන්ද නාය යාමෙන් පසු අදටත් ඉතිරිවී ඇත්තේ අඳෝනාවකි. පිරිසිදු දිය බිඳක් නොමැතිව ජීවිතයත් මරණයත් අතර සටනක යෙදෙන අපේම සහෘදයින්…. තරුණ පුත්‍රයා නොසිතූ විරූ අවස්ථාවක ජීවිතයෙන් සමුගෙන යාම මවකට පියෙකුට කොතරම් ශෝකයක්දැයි අමුතුවෙන් කිව යුතු නැහැ. වන අලි ගැටලුවට වගකිව යුත්තේ ජනතාව ද? එසේත් නැතිනම් බලධාරීන් ද? HE IS TRYING TO CLOSE THE GATE AFTER THE CART HAS BEEN ROBBED.THE ONE AND ONLY WAY TO AVIOD THE CURSE FROM THE PEOPLE TO SOME EXTENT, IS TO SUPPORT POHOTTUWA AT THE FORTHCOMING ELECTIONS. modayo visin modayek path kara ganna ladi. puluwannam dagallala ayith n.og. salli gilla thawa modayek path karagnna balapalla. warenko balanna anaparath ayith modayek aragena. පලයන් ගොන් ඇදුරෝ ඉක්මනටම බෝගම්බරට. වැලිකඩට එහෙ කොර නොගහන උන් ඉන්නවලු එනකන් බලාගෙන. මූ සෝබිතයවත් මරා ගත්ත. කාලකන්නියා. මහාචාර්යතුමා එකක් කඩතොළු මකා ගන්නට ඉඳුරැවේ ආචාරියා ලඟට ගිහිල්ලා !!!! ආචාරියා මහාචාරියාට දෙකක් කඩතොළු සදා දීලා !!!!! මහාචාරිතුමෝ පැත්තකට වෙලා ඉන්න….මේ රටේ සාමාන්‍ය මිනිස්සුන් දැන් ඔබලාට වඩා බුද්ධිමත් …ඒ අය වෙලාවට සුදුසු දේ කරාවි. මූ කවද හරි පාර්ලිමේන්තු ආවොත් ගොං රන්ජලට පාර්ලිමේන්තුවේ තැනක් නැතුව යනවා. Here Wijesuriya, Do not compare MR with Sira. The difference between those two is well known to us. MR is a real and natural leader while Sira is an artificial one. mu 2015 ta pera huchakuwak gana kikiya inna kota hunek wage. dollar kalam dan muge hati. පහුගිය කාලේ වගවීමේ යාන්ත්‍රණයක් ගැන කතා කලානේ. ලංකාවේ කිසිම එකෙක් තමන් කරපු වැරැද්දකට දඩුවම් විදින්නේ නෑ දැන් මෙතුමා “අනේ මම පාඩමක් ඉගන ගත්ත. සොරි හොදේ” කියනව . අඩුම තරමේ ඔය එන්ජිඕ පඩන්ගුව විසිරුවල දාන්න බැරිද? තමුන්නහෙලත් ඔය සිරිසේනලට දෙවෙනි නෑ. ayith warenko balana thawa kalakanniyekwa janapathi karanna. Yako, thopiwa MY3 USE kala. Thawama therenne nedda. Idiriyath oya tika thama. Thopi $$ gilala rata kewa…………. Agamatiya Ranil………….. maha bankuwa sudda caranna sudusuyi. Mohuta aacharya upadhiyak nehe kiyanne hebeda. Kisima paryeshanayak karalath nethilu. Et hakota kohomada mohuta mahaacharya pattamak lebune ? Aanduwata kade yaama nisas wiya yuthuya. warako balllanda ayeth podu apeksakayek aragena. thopita malapaha gahanne. Mahaloku acharya mahacharya samanya daneema binduwai. Sirisenatai Raniltai kisi deyak baha kiyala rate inna ballo balalluth dannawa nodanne depa saththu witharamai. සරත් විජසුරිය කියන විදියට පාඩමක් ඉගනගත්ත කියා මගහැරීමක් කලනොහැක. මොහුට තද දඩුවමක් දිය යුතුය. මොහු හා මොහු වැනි තවත් අය මෙයට හවුල්. මින් රටක් විනාස විය. ජනතාව අද නයබරින්දුක්ව්දී. අනෙක් පැත්තෙන් රටවිකුනා විනාසවිය. මොහුහට දරුණු අපරාද හිතා මතා කල නිසා හිරේ ගොස් කෙලවර උනොත් ඇද්ද.? Gon mahavhariyo tota ohomavela madi. Booru mahavhariya thopita therune nadda me gon vassava path Kara ganiddi ohoma vei kiyala. Me gonata danne thorathonciyak nathuva katata ena de Kianna vitharai. This so call intellectual property robber is ” Awajathaka Paharayek “. This fake professor is cancer to my country…. Thotai Thoge daru Munuburantaiu sapa wewa……..
මොහු හිතාගෙන ඉන්නෙ ඔහුගෙ බහුශ්‍රැත භාවයෙන් ජනතාව වසග වෙලා ඉන්නෙ කියලා. ඒත් ඊයෙ සහ අද ගැන හිතලා හෙට මොනවා වේද කියලා හිතන්න බැරි සාමාන්‍ය මනුස්සයෙක් පමනයි මොහු..